Call it the perfect storm the way SaraBay Real Estate evolved into what it is today. That perfect storm took place over Sarasota Bay at the John Ringling Bridge connecting Lido Key and the city of Sarasota. 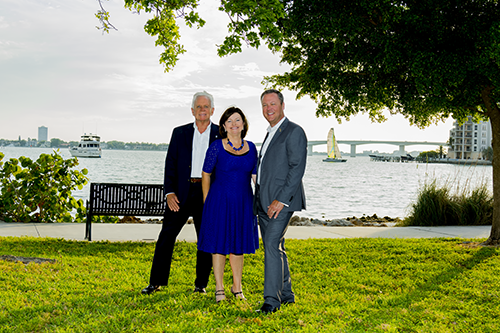 Think of Mike and Judy Holderness, the original founders and owners of SaraBay, as the key and Barry and Sherry Grooms, current co-owners, as the city–different, yet connected. Sitting across from each other in the offices of SaraBay, Barry Grooms and Mike Holderness literally finish each other’s sentences. But this is not the business relationship you’d image. As a 12-year-old boy, Barry was running around Mike and Judy’s home playing with their sons, Michael and Jason. Michael S., as he’s called, was born with the real estate gene. Back then, Mike professed he never wanted to go into real estate, but as luck would have it, the Holderness’ journey led to the industry. Classic case of never say never. Mike served as a selling agent and Judy ran the company, that was 1979. The space purchased for the office location was on the edge of Sarasota and Manatee counties. Now, that area is known to locals as Sara Bay. At the time, only the Country Club bared the name, the same name also worked well for the real estate business because of its proximity to Sarasota Bay and for its favorably and familiarity as it relates to location. Respectfully, Mike went over to Sara Bay Country Club and asked permission to name their new business similarly, but displayed slightly differently as SaraBay. And in turn, the owners of what is now the Sara Bay Marina, came to Mike to ask permission for the name too. You could say the Holdernesses are responsible for creating that pocket of an area, one they referred to as magical. Mike and Judy were known as class acts and admired by many in the industry and community for their ethical and honest nature. Real estate association functions and other gatherings brought the Grooms together with the Holdernesses frequently. “We’d walk away leaving those events, and I’d say to Barry, I just love them,” Sherry says with smiling eyes. The couple served as mentors, even if unknowingly. Judy passed a couple of years ago and today, Mike’s making joint business decisions with Barry and Sherry. It happened one afternoon over lunch, Mike suggested that Barry open a business. While Sherry was on board for growing their careers, Barry declined. Mike responded by saying, “Well, we should do business together.” And there it happened, a continued legacy of SaraBay Real Estate beginning yet another chapter. 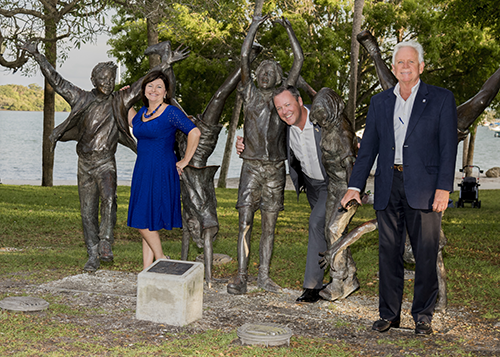 Like a sturdy tripod, each partner has a role; Barry runs the business side, Sherry manages the agents, educating them with the latest technology and acting as their support system, and Mike sells. For the Grooms, real estate came as almost second nature. Prior to becoming business owners, both were employed by big franchises and had made careers in the industry selling. With an innate ability to educate, Sherry’s career path led her into management carving out a role educating agents on the latest technology and identifying the cutting-edge marketing tools and services needed to result in success. It’s a role that earned her the title of master trainer. Seventy percent of agents fail in the first three years in the industry. “The most powerful weapon is being a support, to lift agents up if they are having a not-so-favorable period. I love that part.” Having been in the same shoes, and now getting to put to use given talents of educating and innately nurturing is a fulfilling position. “We take stock in each and every one of our team members; we understand that taking the time to individually support our associates pays huge dividends,” says Grooms. “Taking the time to get to know each associate as a person, professional, and business partner has a mutually fulfilling effect. The amount of time a broker needs to spend with a new agent has greatly increased and pushing them off on canned training systems has proven to be a low return on investment for both the brokerage and the associate. It’s not just about selling a house, the role demands marketing, people, and technology skills. At SaraBay, agents are given the toolkits needed to succeed in all three areas and beyond. A broker is a stakeholder in every associate’s business and they need to take interest in the associate’s success and continue to support and coach them to ensure they are reaching their maximum potential. “Your associates need to believe they can trust you, know you care about them, and that you are a leader before they will do business with you,” states Mike. Meanwhile, Michael S. continues to grow his leg of the business and has been successful with his Siesta Key Beachside Villas and Beachside Management. Adding to his portfolio, Michael S. recently closed on a 52-unit hotel complete with one acre of unbuildable beachfront property that will serve as a place for the new resort’s amenities including beach chairs and umbrellas and recreational water sport devices. “He’s polite, driven, and humble,” says Mike of his son. “He takes after his mother.” That’s classic Mike being humble again, clearly the apple hasn’t fallen far from this family tree. Mike continues to successfully sell. Well dressed with striking white hair offset by sun-kissed golden skin, you can feel his sincerity by his direct gaze into your eyes when he speaks. His demeanor instantly earns your respect. There’s a lifetime of wisdom in those words, spoken with modesty. The team at SaraBay delivers a local expertise, knowing neighborhoods and communities inside and out; call them your local concierge. “Our agents sell communities, not just houses.” Plumbers, restaurants, dry cleaners, events, you name it, they know it. “We are problem solvers, we offer solutions,” Barry adds. Fostering a community and giving back to the community, both as individuals and as a business, is of high importance; Mike has been a fire commissioner for 12 years and the Grooms are actively involved with volunteerism. Two secrets to success are trustworthiness and putting the customer first. Through a sophisticated software program, an inquiry from a customer is delivered within nanoseconds and that customer is taken care of almost instantly by a unique system exercised by the agents. It’s a technique that translates into care, for both the customers and for the agents by having fair lead distribution. The competition between associates is at an all-time high and some compete through guarantee systems, limited service, or promising more than they can deliver. National trends show that a high percentage of experienced agents prefer an independent brokerage model over the national franchisees. The days of the “one size fits all” are rapidly slipping away and custom agent synergic models are more appealing to the full-time professional. Due to the widespread availability of top-shelf systems and tools, the price has been driven down immensely allowing the independent companies to have considerable room for competitive commission packages. Before the crash of 2007, if you wanted the best technology, commission split, or agent toolbox you had to be with a franchise. Now, there are hundreds of technology companies, marketing partners, and brokers that offer what the “big boys” do and deliver it fully and without the franchisees fees. A third secret to success is human relations, the ability to communicate, anticipate needs of the customer, and to listen to exactly what is desired. When you go to list your home with SaraBay, you might end up staying where you are and it’s not because of lack of skill from the owners or agents. It’s because you may just already be in the right place. Such was the case with clients of Barry’s. As he listened to a couple talk about the personal improvements they had made to their home–the deck they built, the carefully-selected features of the new kitchen, and other small touches–they lit up, seemingly from the inside with wide smiles. When asked to draw up a wish list for a new home, it was discovered that they were already in their dream home and didn’t realize it. Yet, Barry listened carefully and showed other properties until the couple saw for themselves it wasn’t in the best interest to sell. A similar incident happened with Mike from a would-be seller who wanted to list her home when the market wasn’t right. “Timing is everything,” Mike assured and knew it was not the right time to list the home for the seller to have a successful transaction. The consumer is more informed and educated than ever and the vast majority of homeowners and homebuyers are seeking value; if they see the value, they will choose it over low cost. It’s not to say growth isn’t welcomed, a second office location recently opened in downtown Bradenton. The business is built on an authentic approach, a family-like feel, and remaining deeply rooted in the area. With the believe that profit comes if you do things right, not to be confused with perfect, but by doing the right thing. The company has approximately 50 agents and each are cared for both personally and professionally. The trio pinch themselves about the experience of owning and evolving SaraBay Real Estate through the culture and business structure put into place. Success is a by product of doing their dream jobs. I think they already have. The REAL Trends 500 | Ranking the Top Brokerages in the U.S.